The venerable Rolls-Royce V-8 engine, which in one form or another has powered more than 70% of all RollsRoyce and Bentley cars ever built, has been the subject of extraordinary claims in the press recently that its design is American in origin. The March/April 1995 issue of the R.R.E.C. BULLETIN contained a letter to the Editor from Jack Phillips, who led the team that designed the engine, which was known within the factory as the 'L' engine The following is based on that letter, omitting only some brief passages not dealing with the engine itself. Several times during the past few years I have heard the assertion that the Rolls-Royce V-8 engine owed its design to American technology, and it is high time to set the record straight. It is hurtful to those of my team, all of whom were (many still are) without doubt the most skilled engineers in the country when the V-8 was designed and developed at Crewe. In point of fact, G.M. exchanged one of our V-8s for one of their cars to study our design, especially the water heated automatic choke design system for the S.U. carburetters. Moreover, my colleague, the late Ronnie West, and I went to Detroit to discuss the spate of tappet failures which were then troubling G.M. and Chrysler. We also had had the odd testbed tappet failure, but were assured by their engineer: 'You don't have a problem', and we were able to tell them how we overcame ours! Rolls-Royce Experimental Department bought competitors' products, especially American cars, and it was my habit to put engines on test to run at maximum power until failure (usually a valve or piston). We never managed to complete 100 hours FT (full throttle) on an American engine, but the 'L' engine did 450 hours FT to convince Harry Grylls (Gry) of the soundness of the main bearing caps; that is a measure of the reliability of the engine in the present car! To start at the point of conception of the V-8: this arose from a set of requirements laid down by Gry in late 1953, which I itemised in my Paper read before the Institution of Mechanical Engineers (ADP9/61) on 27th March, 1962. The engine should fit under the same bonnet as the six, and use the same radiator. This request was difficult to meet and certainly could not have been satisfied by copying anything on the American market, even partly. 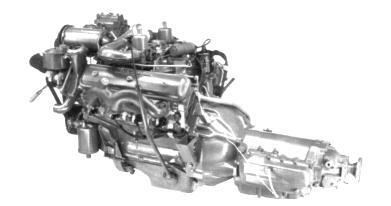 With one exception all American V-8s were iron; we needed light weight so aluminium alloy was used. To do a Rolls-Royce job one needs to be better than anyone else, but there is no sense in 're-inventing the wheel', and 'zero lash' hydraulic tappets were a case in point. Our cam-form and valve timing necessitated short opening and closing ramps and 0.875" diameter tappets, so I went to America, had a good look around, and ordered several sets of tappets which, I think, came from Chicago Screw, who made tens of thousands a day. No-one in the U.K. could make them, so when they proved satisfactory Rolls-Royce, in its inimitable way in those days, bought the necessary machine tools, built a clean room and set about making them. The result is mentioned above, we were asked by our worried friends to tell them how we did it! In this case it was not wholly dimensional design but Allan Whittaker's metallurgical laboratory who showed how the necessary reliability could be achieved, together with extensive investigation into metallic additives to lubricating oils. The choice of flanged wet liners, sealed at the bottom by Merlin type 'O'-rings, was made to ensure that the bores remained as near circular as possible throughout the temperature range and coolant capacity reduced to a minimum within the cylinder block to give a quick warm-up - not easy with a large block of aluminium. Incidentally, the V-8 engine was 30 lb lighter than the previous in-line six. The coolant system is patented. Have a look how the stresses are carried from the heads to the main bearings by through-bolts both on this engine and the opposed piston two-stroke diesel which we were designing at more or less the same time. There is nothing new under the sun, and quite recently a British engine was given a Design Award using the same design philosophy as I employed thirty odd years ago! When the V-8 engine was designed we were selling 'B' range engines to the Germans for their light tank, and 'X' engines to Volvo. There was therefore no reason for me and my team to copy anyone. If members so desire, I would be only too willing to state why each line on the design of the 'L' engine was drawn where we placed it. Sorry to have to destroy this latest myth so strongly, but I am sure all will understand our sadness at the inability to modernise the existing sturdy product.